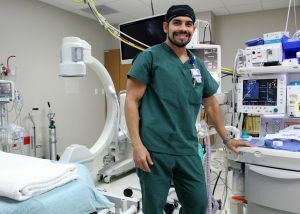 (HARLINGEN) – From homeless to a six-figure salary, Texas State Technical College Surgical Technology graduate David Flores accomplished what he set out to do – turn his life around. The Donna native graduated from TSTC with a certificate in 1997 and with several job offers. The 41-year-old is now a Certified Surgical First Assistant at Rio Grande Regional Hospital in McAllen, where he started as a surgical assistant immediately after college. He has been with the hospital for 22 years and has seen raises and promotions he never expected; but it was not easy getting to where he is today. At the beginning of the Surgical Technology program, Flores and his family were homeless and living in a warehouse where his dad worked for little money. Because his family could not afford even the basic needs, Flores did not have transportation to class and instead had to rely on fellow students for a ride. Since then, Flores has made a name for himself in the healthcare community working with various surgeons, physicians and hospital directors around the Rio Grande Valley. He is one of the first doctors call to assist with cases and surgeries. He was even one of the first from his hospital to be recommended for a nine-month surgical first assistant certification course, which he completed successfully. Flores has come a long way from the high school student who knew what he wanted to do, but had no idea how to make his dream a reality. Flores remembers teachers and counselors pushing him to be a nurse and advising him that’s the only way he would make his dream come true, but deep down that is not what he wanted to be when he grew up. Flores does not recall the TSTC representative’s name, but said because of her, he enrolled at TSTC before even graduating from high school. While his friends were enjoying their summer, he began the journey toward his new career. His career has led him not only to Rio Grande Regional, but also as a contracted surgical first assistant for doctors across the Valley and to Guatemala, where he has done two years of missionary work providing free medical and surgery services to those less fortunate. From passing tools to his father while he repaired cars to passing tools to surgeons while they operate, Flores said he has come full circle, and it’s his father who serves as his inspiration. Flores has also worked closely with TSTC’s Senior Surgical Technology Instructor Anna San Pedro in initiating a preceptor program, which assigns students to mentors, sits on the TSTC Surgical Technology advisory board and has been named TSTC’s Preceptor of the Year for two years. For more information on Surgical Technology, visit tstc.edu.